What happens when a superstar reunites with almost all of his leading ladies? It is a reason to celebrate. 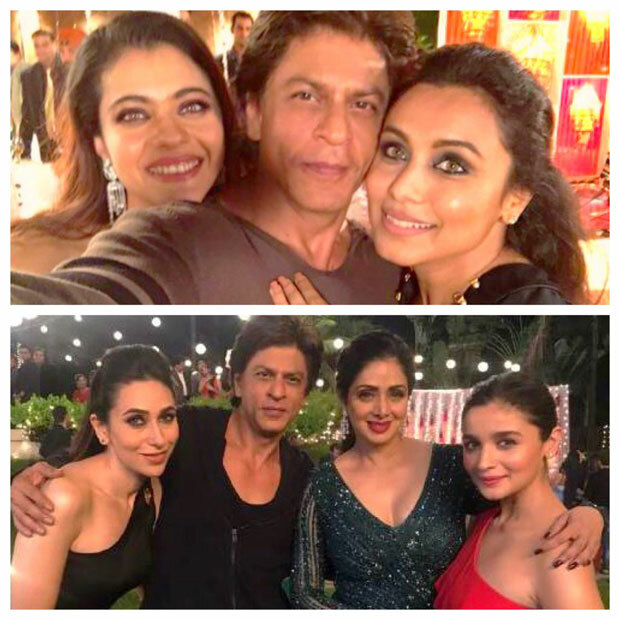 Last night, Shah Rukh Khan shared a photograph with Kajol and Rani Mukerji and another one which had Sridevi, Karisma Kapoor and Alia Bhatt. What made the internet lose it was the Kuch Kuch Hota Hai trio Shah Rukh Khan, Kajol and Rani recreating their pose. They starred in Karan Johar’s directorial debut. Another set of ladies included Sridevi, with whom Shah Rukh Khan had starred in Army. Karisma Kapoor and SRK did the classic Dil To Pagal Hai as well as Shakti. Alia Bhatt and SRK were seen in Dear Zindagi last year. They had a mentor-mentee relationship in the Gauri Shinde directorial. On the work front, Shah Rukh Khan is busy working in Aanand L Rai’s untitled film starring Anushka Sharma and Katrina Kaif as leading ladies. SRK will be seen as a dwarf in the film. Katrina Kaif and Priyanka Chopra were approached for Aishwarya Rai Bachchan’s role in Fanney Khan! Will Rami Malek Rock The Academy?